The capabilities of HTML and Rich Text, in formatting how the content actually looks, are pretty similar. They are both able to assign colors, size, and font types to the text, as well as format paragraphs. Rich Text lacks certain features that are related to internet use, such as linking to files, other web pages, and other protocols like emails. These capabilities are standard in HTML, as it is necessary to link from one site to another, or within the same site. It is also necessary to access other resources on the internet. An area where HTML and Rich Text are seen together, is in emails. When composing emails, you are given the chance to choose between the two. Using HTML allows you to present your email just as it would appear on a web browser. You can even link to pages on the internet so that the reader can simply click on them, and go directly there. This practice is very common in websites that require registration. You will then receive an email from them, with a link that confirms the email address you entered on their website. Rich Text lacks this functionality, which is actually a good thing, since it also lacks the vulnerabilities that can happen in HTML emails. Malicious people can put in links to downloadable malware, that can harm your computer. Some people also recreate the look of an email from a huge company, and ask for your username and password, in an act called phishing. 1. HTML is a markup language used to build web pages, while Rich Text is a type of format for documents. 2. 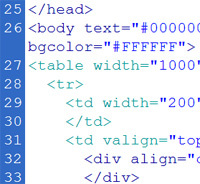 HTML has extra features that cannot be found in Rich Text. 3. An HTML email can contain links and other things that can be dangerous, while a rich text email is safer. Ben Joan. "Difference Between HTML and Rich Text." DifferenceBetween.net. June 5, 2018 < http://www.differencebetween.net/technology/difference-between-html-and-rich-text/ >. How to put pictures in email body itself, without a need to attach it.